Rooms are clean and breakfast buffet was good. Pool and hot tub were clean. Where to find Ripley hotels near an airport? Where can I find hotels in Ripley that are near tourist attractions? For those who are looking for accommodations near Ripley, there are a few places from which to choose. 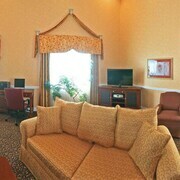 There are 3 Expedia-listed accommodation options within easy driving distance of the downtown area. 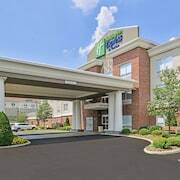 If you are looking for a hotel that is only a short stroll from the Ripley city center, Holiday Inn Express Hotel & Suites RIPLEY and Quality Inn of Ripley will be perfect. 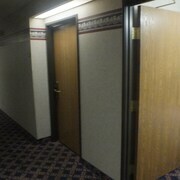 1 kilometre (1 mile) away from the center of Ripley, is the Super 8 Ripley WV. For those who are keen to see some more of the mountains and rolling hills that are a big feature in this region, you might also plan some extra days in other places in Central West Virginia. You can tour regional places of interest or enjoy mountain biking and rock climbing and then book a convenient place to stay the night. Looking for more things to do? Spend the day discovering West Virginia Motor Speedway and Scott Field, in Mineralwells, 45 kilometres (27 miles) to the northeast of Ripley. 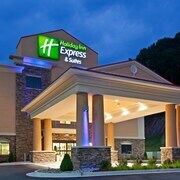 The Holiday Inn Express Hotel & Suites Parkersburg-Mineral Wells and Comfort Suites Parkersburg South are some of the hotel and apartment options in Mineralwells. 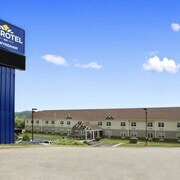 Or, you could consider staying in Parkersburg, 50 kilometres (32 miles) to the north of Ripley, where you can choose from the The Blennerhassett Hotel and Comfort Inn near Grand Central Mall. If you're staying in Parkersburg, set aside some time to visit the Blennerhassett Museum and Oil and Gas Museum. Why not spend a few hours cheering along with Central West Virginia sports fans at a local match. You'll find Appalachian Power Park 55 kilometres (33 miles) to the south of Ripley. For those who are interested in booking accommodation close by, make a reservation in the Embassy Suites Charleston or Charleston Marriott Town Center. Yeager Airport is a convenient airport for accessing Ripley. It is 50 kilometres (32 miles) drive away. If you plan to stay nearby, try the Residence Inn By Marriott Charleston or Charleston Capitol Hotel. What are the most popular Ripley hotels? Are there hotels in other cities near Ripley? What other types of accommodations are available in Ripley? 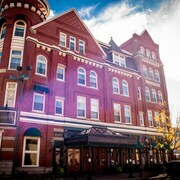 Explore Ripley with Expedia.ca’s Travel Guides to find the best flights, cars, holiday packages and more!